As sworn Law Enforcement Officers of the Village of Stryker and the State of Ohio, it is incumbent upon us to uphold the laws set forth to protect the population and ensure the tranquility for the citizens of our Village, County and State. Our job is never easy, and the work we do is often thankless. We are called upon, and are sworn to complete certain tasks that take split second decisions and actions in order to protect our life and the lives of the public. It is our duty to remain alert, continue with education, and know the proper remedy for the problems that may arise. Within our ranks, we strive for consistency, compassion and professionalism. The goal for each officer is to represent their position within our Department with dignity, respect and courage. We have one common mission; to provide unparalleled selfless service to our community. Our Department currently has 3 full-time officers, 6 part-time officers and 1 Chaplain. Extra duties include a dedicated Special Response Team, complete with carbine rifles, entry level gear, and designated marksmen. This team could respond to critical situations including Active Shooter and School Based Incidents. We also have a Terrorism Liaison Officer that works in conjunction with the Department of Homeland Security to detect and deter this type of activity. 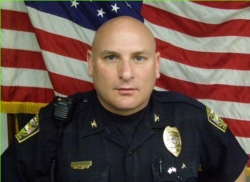 Steve’s career in law enforcement started in June of 1996 as part-time officer with the Stryker Police Department, and was promoted to Sergeant (part-time) in September of 1998. He took a full-time position with the Village of Montpelier in February of 2000. This tenure ended when he had the opportunity to come back to Stryker in August of 2005, as the Assistant Chief of Police. Steve was promoted to his current position of Chief of Police in October of 2010. Steve also served in the United States Marine Corps, and retired in May of 2009 with the rank of Gunnery Sergeant. During his career as a Marine, he served on Active Duty with the Fleet Anti-Terrorist Security Team, based in Norfolk, Virginia. His primary occupational specialty was Infantry, and served in Operation Just Cause (Panama 1989), Operation Desert Shield/Desert Storm (1990), and Operation Provide Comfort (Haiti 1992). Upon his release from Active Duty, Steve continued his service in the United States Marine Corps Reserves, with Weapons Company, 1st Battalion 24th Marine Regiment. Tours of Duty include combat deployments in 2003 and 2006 in Operation Iraqi Freedom and Operation Enduring Freedom. Biography and picture coming soon. Springfield Township/Stryker Fire Department protects Springfield Township and the Village of Stryker, Ohio. Springfield Township is located at the Southeast corner of Williams County, Ohio. Springfield Township has an approximate population of 1821 and an area of 33.3 Sq Miles. Though some staff are paid, we are really a volunteer fire department, relying on the heroics and community service of those people committed to the safety of the area. All members are required to complete 24 hours of training each year. The fire department has six pieces of fire fighting equipment, and two fire stations to use to effectively protect the Village of Stryker and Springfield Township.